After a cloudy Saturday that eventually led to almost 11 millimeters of rain on the Mid-Ohio Sports Car Course, the IZOD INDYCAR Series Honda Indy 200 started under more agreeable Sunday skies. Thanks to the hard precipitation from the day before, Sunday's 85-lap event around the 2.258-mile road course would present a track with reduced grip as tire rubber was washed away. With only a brief warm-up session for the open wheel cars to rub the Firestone racing slicks into the Mid-Ohio track, drivers would be tested under even lower grip on track than during qualifying the previous day. Taking pole for the first time in 2011, Scott Dixon led the 27-car IZOD INDYCAR Series starting line-up to green driving his #9 Target/Chip Ganassi Racing machine. Dominating early, Dixon and the #9 car crew were amped up within the Honda Indy 200 after posting fastest time in the open wheel racing series' morning warm-up. Leading through the first 23 laps, the New Zealand driver was on pace early to claim his first IZOD INDYCAR Series victory since the 2010 finale at Homestead-Miami Speedway. A race interrupted twice for caution, the yellow flag period accounting for only 9 of the 85 laps played an important role in the Honda Indy 200 at Mid-Ohio. The first caution flew on lap 22 when Sebastian Saavedra sailed off track in the turn 2 Key Hole portion of the race track. Ending the day for IZOD INDYCAR rookie Saavedra as his #34 car impacted the tire barrier, the caution period allowed another first-year driver to rise to the occasion. Pitting out of sequence by his Newman/Haas Racing team after tripping off track, Canadian James Hinchcliffe stayed out while many of the race contenders attended pit lane for service under the first yellow flag. Leading for 26 laps total at the Mid-Ohio Sports Car Course, the time spent at the front for the #06 Sprott-sponsored car was Hinchcliffe's first leading laps on the IZOD INDYCAR circuit. Scott Dixon would end the rookie's reign at the front on lap 53. Dixon's teammate Dario Franchitti would also lead briefly as teams began to make final pit stops. As James Hinchcliffe's car created a new spectacle in the first place position of the Honda Indy 200, the #7 Andretti Autosport car driven by Danica Patrick also attempted to retain a top position by staying out on track. Patrick eventually needed to pit for fuel as her race vehicle was part of the four-car Andretti Autosport effort looking for a better result than through qualifying. With only Ryan Hunter-Reay collecting a top-16 start, Danica Patrick as well as Mike Conway and Marco Andretti had alot of ground to my up at the Mid-Ohio Sports Car Course. While Conway retired late with mechanical problems, Andretti in the #26 car stormed from 19th to finish the Honda Indy 200 in 7th position. 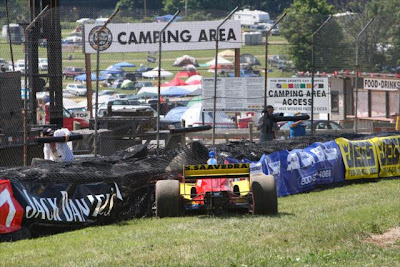 Setting up the Honda Indy 200 at Mid-Ohio late stage, the #7 car of Danica Patrick collided with the #38 of Graham Rahal through turn 2 resulting in a final race caution. The yellow flag was an untimely caution for Penske Racing drivers Will Power and Ryan Briscoe who were leading the way of the event. Due to the caution on track, the Penske Racing #6 and #12 cars had to pit once the field was collected behind the pace car. Unable to recover from being buried behind almost the entire lead lap grid of vehicles, Will Power ended the day in 14th place (only the second time in 3 years with Penske Racing the Australian finished outside of the top-10 on a IZOD INDYCAR road course event). After contending a race win or at least a certain top-5 finish, a dejected #06 car's driver piloted the Newman/Haas Racing car to 20th place. Finishing down the order after a brilliant show at the front of the Mid-Ohio Honda Indy 200, Hinchcliffe did finish ahead of top Rookie of the Year in the 2011 IZOD INDYCAR Series JR Hildebrand. On lap 27, Hildebrand's #4 car and the #59 KV Racing Technology car of EJ Viso made contact costing the Panther Racing #4 machine several laps on track. With no opposition, Scott Dixon's #9 car flew to victory at the Mid-Ohio Sports Car Course. 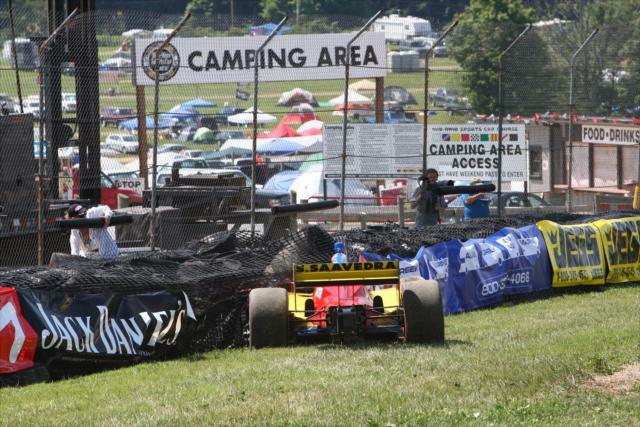 The first win of the 2011 season for Dixon, this is the New Zealand driver's three victory at the Lexington, Ohio race course. 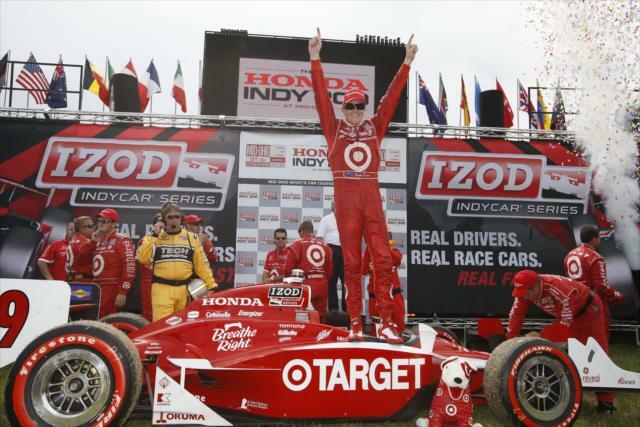 Winning previously in 2007 and 2009, Scott Dixon and the #9 Target/Chip Ganassi Racing team continues a pattern of victory at Mid-Ohio in every other year. Leading a 1-2 finish for the Target/Chip Ganassi Racing group, Dixon was 7.65 seconds ahead of his #10 car teammate Dario Franchitti. Despite the distant runner-up finish, the Scottish Franchitti did claim a major advance in the 2011 IZOD INDYCAR Series overall points lead over second place Will Power. After being tied for first place four races earlier this season, Franchitti has gained a 62-point gap over the #12 Penske Racing driver. In 3rd place at the end, Andretti Autosport's Ryan Hunter-Reay collected his second podium result in the past three races. Rounding out the top-five cars finishing the Honda Indy 200, the KV Racing Technology cars of Takuma Sato and Tony Kanaan placed their Lotus Green racing machines at the top of the IZOD INDYCAR's Mid-Ohio Sports Car Course race. Other notable finishes after the 85-lap Honda Indy 200 included Alex Tagliani in 6th spot, Oriol Servia who rallied from a 20th starting spot to finish 8th and a 9th place for French driver Sebastien Bourdais. For Bourdais, the Mid-Ohio race marks the third straight finish with Dale Coyne Racing in the top-10. After three road course races, the IZOD INDYCAR Series returns to ovals with an August 14th event at New Hampshire Motor Speedway.